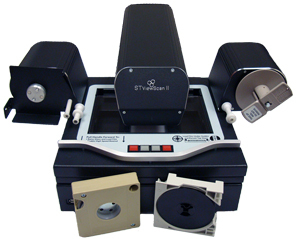 The standard ST ViewScan 4 is capable of scanning 16mm film and 3M cartridges. Today’s competitive business world demand fast answers to questions. This applies to information contained in your film archives and is why the ST ViewScan 4 System is the idea replacement for the old Canon or Minolta reader printers. The ST ViewScan 4 system allows you to quickly browse the film as the film is advancing or quickly move to the image if the film contains the necessary blip marks. Once the image is identified it can be easily captured and shared via standard communications methods such as e-mail, saving to a file server or even out to the cloud. Regardless of the original film capture magnification, ST ViewScan 4 can easily capture the image. If your business has a mixed film environment, you will find the ViewScan 4 system can handle all types of film. That includes 3M cartridges. The 3m film option allows you to quickly switch between standard rolls and 3M cartridges with minimal effort. Just as important as the ability to find the archived information, is the ability to create a high quality image and optionally annotate it with relative information. The ST ViewScan 4 system gives you extensive editing and image enhancement capabilities to help you restore old film records quickly. So regardless of the type of film or age, the information can be retrieved. Call us today to arrange for a demonstration of the ST ViewScan 4 system at your facility using your film and see how this valuable archive can be merged into today’s electronic records. Film Accepted: Microfiche, Jackets, Aperture Cards, 16mm & 35mm Roll Film, 16mm Film Cartridges (optional). Scannable media reduction range combined optical and digital 7x to 105x, optical 7x to 30x. Go here to view the ST ViewScan 4 brochure.